Another interesting thing about the Rainbow Bridge is the prominent anchorages for the suspension cables. The anchorages include elevators to the south and north walkways on the lower bridge deck. The north walkway provides views of Tokyo and the south walkway provides views of Odaiba (and of Mt Fuji on clear days). The walkways can pitch and roll when there's a strong wind. The anchorages also include observation platforms for viewing Tokyo Bay. Note how the Yokoso Rainbow Tower (on the left side of the photo) matches the color and shape of the anchorage. It was built in 1995, two years after the bridge. 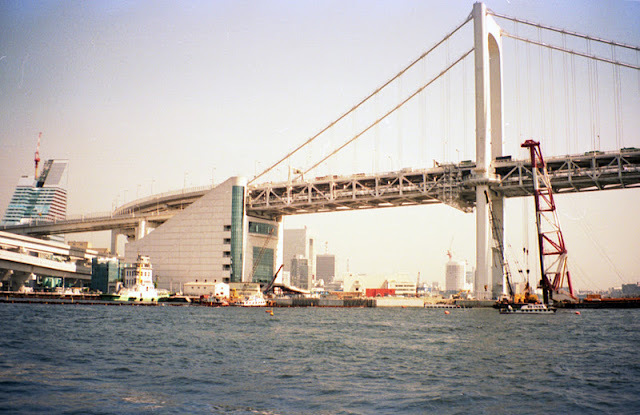 Tokyo Bay Bridges: Rainbow Bridge (3) by Mark Yashinsky is licensed under a Creative Commons Attribution-NonCommercial-ShareAlike 3.0 United States License.